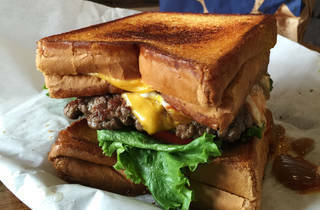 Engulfing a cheeseburger between two grilled cheese sandwiches may sound overwhelming, but the signature sammie at this brick-and-mortar spinoff of a food cart in Southwest Portland is enormously popular. Called YouCanHasCheeseburger, after a distinctly goofy Internet meme, the hearty handful serves up a griddled beef patty with American cheese, lettuce, tomato and grilled onions, plus ketchup, mustard and mayonnaise. 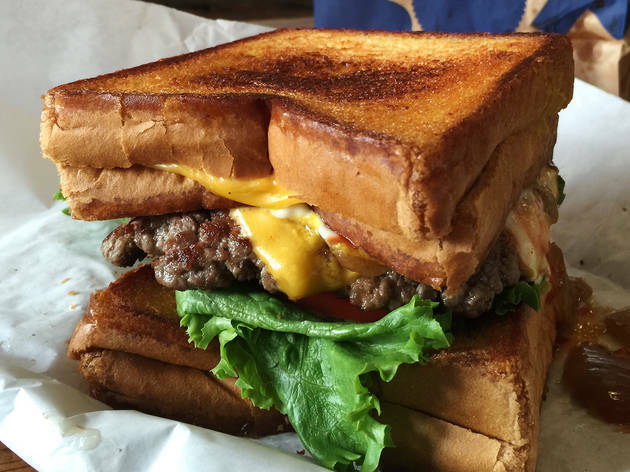 The already-indulgent patty is then sandwiched between two grilled cheeses on Texas toast. Day passes to the nearest gym are regrettably not included.